Here is a brand new, very old idea about what to do with your bike in off-biking season: use it for something useful. Like sharpening scissors and knives. Many of what have been out-dated or even dying trades and professions are slowly but surely coming back, this time dubbed „slow“ or „vintage“ or „retro“. And making it to the hipster scene (or at least: attracting hipster customers) by this cutting-edge marketing lingo, attached to a really old idea and trade. 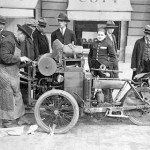 Note that bikes and machines with some sort of transmission belt have shared quite a history already – start with Opel and Miele here in Germany and hop over to sewing machine manufacturer Singer in New York. And add Madrid now, as there we may see the resurrection of the nicest things of life (read: bikes) with life’s necessities (work). 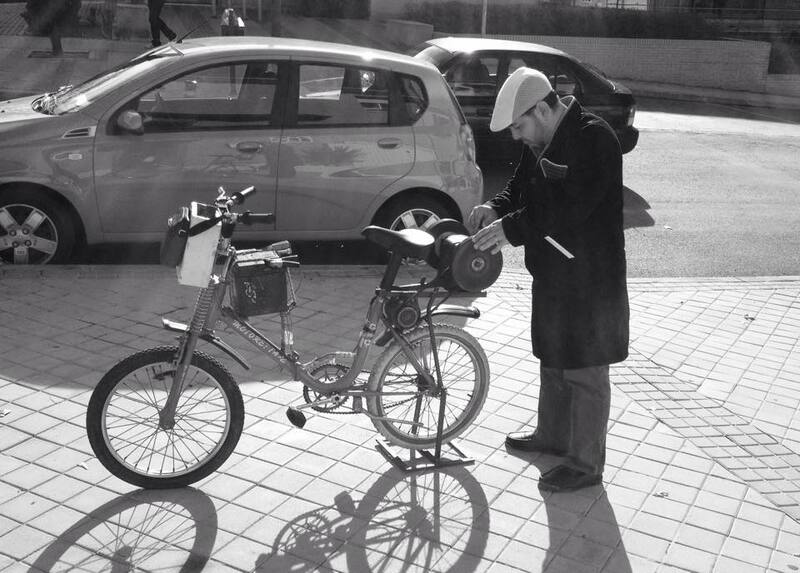 – Looking forward to spotting the first mobile retro knife grinder in German hipster cities such as Berlin. Read more about this nostalgic lingering for services and trades that have (almost) died out at Brigitte.de (in German) where the teaser picture of this blog entry was taken from, too.